I found this recipe at Taste and Tell, and she got it from Barefoot Contessa Parties cookbook. It’s more about the sauce than the fish, and the sauce tasted delicious! Place the mayonnaise, sour cream, vinegar, basil, dill, scallions, salt and pepper in the bowl of a food processor fitted with a steel blade. Process until combined. Add the capers, pulse two or three times. Prepare salmon as you like. 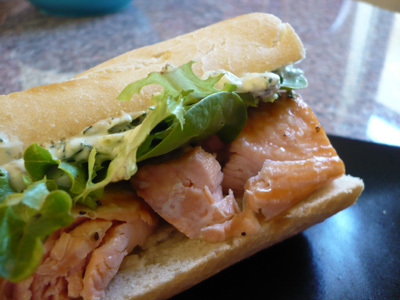 Spread the sauce on the roll, top with salmon and greens.